Five down, one to go! I moved quickly from the excellent Phineas Redux to The Prime Minister. As long as I have caught the Palliser wind I figured I might as will finish the marathon, so I have already begun the last novel of the series. But before I get too many chapters into The Duke’s Children, let me jot down a few notes about the one I have just finished. As usual Trollope highlights the character of the social climber, that ubiquitous unfortunate who has the outward appearance and tastes of the upper class but lacks the capital to support himself in the style he craves. This scenario generally results in romances and marriages of dubious purpose, debt, and desperation. In the case of this novel these themes were all present in their most extreme expression. In Phineas Finn the titular character is a social climber who was also presented to the reader as a decent human being with a real sense of morality. Phineas didn’t always comply with his moral sense, but the point is he has it and suffers guilt when his actions come up short of his own standards. In The Prime MInister we meet Ferdinand Lopez, a social climber who lacks something of that basic core of decency. It is interesting that while the other characters in the world of the novel finally and universally consider Lopes to be “a bad man”, Trollope, as omniscient narrator, digs a little deeper into his psyche and reveals that Lopez is simply a man who lacks an understanding of what it means to be “good.” He equates goodness with having money,keeping one’s temper under control, and presenting a high-class appearance to the world. This error is quite understandable in a culture in which everyone behaves as if having money does equate to being good (as in being from a “good family”) and not having money makes you undesirable company and your motives automatically suspect. So the first thing not to like are the more tedious parts concerning 19th century Parliamentary politics. But I did find it interesting that there was some reference to the building up of armaments that would lead to the first world war. Of course Trollope would not have known for sure what it would lead to unless he could see the future. At least this book did not include a single fox hunt. The other thing that rather annoys me are the frequent references to Ferdinand Lopez’s lineage, indicating suspicion that he might have some Jewish blood. Gasp. Sadly it’s difficult to read very long in 19th century English literature without running into antisemitism. It is an unpleasant presence in history like classism, suppression of women, and syphilis. If you want to go back and indulge in the joys of Victorian literature you have to take the bad with the good. So what happens in this novel is that a rich old-money girl, Emily Wharton, falls for this shady but handsome Lopez character. Her father is appalled at the very thought of his daughter marrying this interloper with no known parentage, but when Emily persistently insists she loves the guy, he finally weakens and relents. She marries Lopez and the heart of her other suitor, the perfect-in-every-way darling of the family, Arthur Fletcher, is shattered into a thousand pieces. Meanwhile the Duke of Omnium reluctantly becomes PM and the Duchess goes on a spending binge of throwing elaborate parties to promote her husband’s popularity. Ferdinand Lopez worms his way into getting invited to these lavish affairs and uses his charm and good looks to become a favorite of the Duchess. In opposition to both her husband’s request and the new reform laws, the Duchess attempts to use her influence to get Lopez into Parliament. Marital strife, scandal, and unforeseen consequences ensue. I am almost sorry I have only one book left to read in the Palliser series. Fortunately Trollope was one of the most prolific writers who ever lived and I will need to read for a long time before depleting that mine. The entire Barchester Towers series awaits! 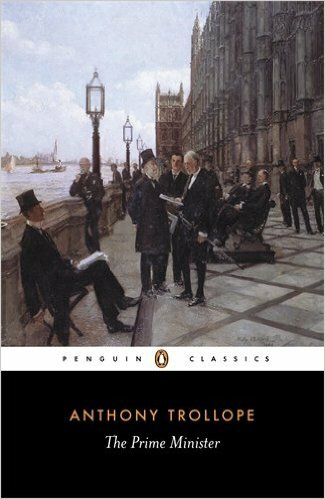 NOTE: I listened to the the unabridged audio version of The Prime Minister, narrated by Simon Vance, produced by Blackstone Audio, Inc. Simon Vance greatly increases the pleasure of reading Trollope. If you are reluctant to tackle such a dense novel, let me tell you: Listening to Simon Vance’s perfect accents and nuanced reading makes even the more tedious parts a treat. I got my copy free through Hoopla and my public library.